Based on expert reviews and user feedback, the Philips SlimStyle 10.5W (60W) Medium base (E26) A19 (Est. $6) is an easy pick as the Best Reviewed LED lightbulb, and the best lightbulb overall for general use. This 10.5-watt, 830-lumen bulb has a unique flattened shape that distributes the individual diodes around the edge of the bulb, putting them farther away from the heat source at the bulb's base. This design eliminates the need for the bulky aluminum heat sink found on many LED bulbs. As a result, the Philips SlimStyle is smaller, lighter, and most significantly, cheaper than many competitors. The flattened shape does produce a faint dim spot on each side of the bulb, which is most noticeable when it's used under a lampshade. However, professional tests find that it still does a good job of distributing light in all directions around the fixture. It also gets good ratings for longevity, consistent with its claimed lifespan of 25,000 hours or 22.8 years. However, the bulb is only backed by a 3-year warranty. The Philips SlimStyle works with all types of dimmer switches – but according to reviews, not very well. Reviewers say the bulb buzzes and sometimes flickers when dimmed, and it can only be dimmed to about 25 percent of its full light level. Also, several reviewers at Amazon were annoyed to discover after buying the bulbs that the package says they're "not suitable for totally enclosed fixtures" – a limitation that isn't noted anywhere on the Philips website. Aside from these shortcomings, however, it's a good all-around bulb at a great price, and users at Amazon.com grant it a 4.5 star rating based on around 1,650 reviews. The bulb is available in both soft white and daylight versions. If you're looking for something that's even less expensive, the Great Value LED Light Bulb 10W (60W Equivalent) Omni (E26) Dimmable, Soft White (Est. $4) is a good choice. Sold exclusively at Walmart, it's slightly more efficient than the Philips SlimStyle, requiring just 10 watts to produce 800 lumens of light. In professional tests; it does just as good a job as the Philips of spreading light evenly and showing colors accurately. And unlike the Philips, it can be used in a fully enclosed fixture. Testers at TheSweethome.com also found that the Great Value bulb works very well on a dimmer, going from fully bright to very dim with no buzzing. User reviews, while strong, are also very limited compared to the Philips bulb -- just under 25 at Walmart.com. What feedback there is looks good, and the bulb earns a 4.3 star rating, but some warning spots emerge. Reviewers at Walmart warn that this bulb doesn't work with all dimmers: you need one that's LED/CFL compatible or the bulb won't dim fully. There were also a few complaints that the bulb flickers a bit on the low setting. Like the Philips, this bulb has a rated lifespan of 25,000 hours and comes with a 3-year warranty. 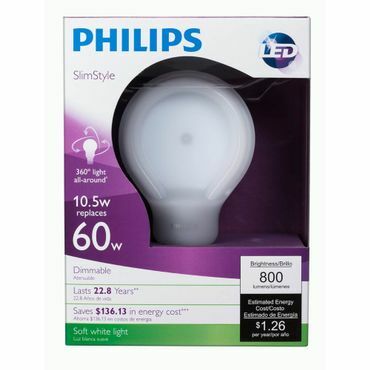 Another low-cost option is the Philips 8.5 W (60 W) Medium Screw Base Soft White Bulb (Est. $9 for 2). This bulb is extremely efficient, producing 800 lumens of light with just 8.5 watts of electricity. It also spreads light evenly, and color accuracy is good. Its rated lifespan is shorter than the other bulbs, at just 10,000 hours, but that's still over 9 years in a fixture that gets 3 hours of use per day. Its biggest drawback is that it won't work with a dimmer – but for circuits that don't have one, this bulb does a great job at a bargain price. User feedback is good, including a 4.5-star rating at Amazon.com based on nearly 700 reviews. LED floodlights don't receive as many reviews as standard LED bulbs, but the Great Value LED Light Bulb 10W (65W Equivalent) BR30 (E26) Dimmable, Soft White (Est. $8) gets high marks from both professionals and users. This bulb isn't quite as efficient as the other standard Great Value bulb discussed above, requiring 10 watts to produce 650 lumens of warm white light. However, it does a good job of lighting up a specific area, spreading its light across a wide, 110-degree beam. It can be used with dimmers, timers, and motion sensors, and it's okay to use in fully enclosed fixtures and outdoor fixtures (as long as the bulb isn't exposed to moisture). Like most LED bulbs, this floodlight bulb has a rated lifespan of 25,000 hours. Professional tests confirm that the bulb does indeed stand up well to repeated use. Reviewers at Walmart like this bulb's warm, bright light, low price tag, and 3-year warranty. The main complaint about it is that, like the other Great Value bulb, it only works with certain types of dimmers. Like other Great Value bulbs, the Great Value BR30 is sold only at Walmart. If you don't shop at Walmart or don't have one in your area, the Philips LED 65 Watt equivalent SlimStyle BR30 (Est. $7) is a good choice. Like the other Philips SlimStyle, this bulb has a flat design, with the LEDs distributed around a flat disk that's attached to a narrow base. Professionals and users agree that the 9.5-watt bulb gives off plenty of well-directed light across a wide beam. It can be used with dimmers, but not in enclosed or outdoor fixtures. The other catch is that this bulb is available only in a "daylight" version, which gives off a bluer light than the soft white most people prefer for indoor uses. Some reviewers at Amazon.com say they loved the cooler light once they got used to it, but others complain that it's too harsh and glaring. The Philips LED BR30 is also a bit pricier than the Great Value bulb in stores, though you can find good deals for it online. Compact fluorescent light bulbs, or CFLs, don't earn nearly as many recommendations as the newer LED bulbs. Although they're almost as efficient and usually cheaper up front, they just don't perform as well in expert tests. In fact, most professional sources don't even cover them anymore. The one bulb we found that earned a recommendation from a professional source is very hard to find at retail, and most of the bulbs that get good reviews on retail sites have been discontinued and will become unavailable as soon as retail stocks run out. It seems manufacturers are paring down their CFL offerings and choosing to focus on LEDs instead. With that as a background, we found one general-purpose CFL that is easy to buy and gets acceptable ratings (and even that's based on limited feedback): the TCP 68914DLB10 CFL Mini Spring A Lamp (Est. $23 for pack of 10). This bulb earns an overall rating of 4.7 stars out of 5 from about 30 users at Amazon.com. Most owners say this "daylight" bulb produces a very bright, natural light, but some find it a little too harsh. Also, like most CFLs, it can't be used with a dimmer. The TCP bulb uses 14 watts to produce 800 lumens of light and has a rated lifespan of 9.1 years. As far as we can tell, this bulb is available mainly from Amazon and other online sellers. If you buy in bulk, you can get them for a little over $2 a bulb, which is just cheap enough to make them a reasonable alternative to LEDs. Smaller, three packs are available as well, but that brings the price up to the point where it's only a little cheaper than our top rated LED bulb, and even costlier than our budget LED alternatives.